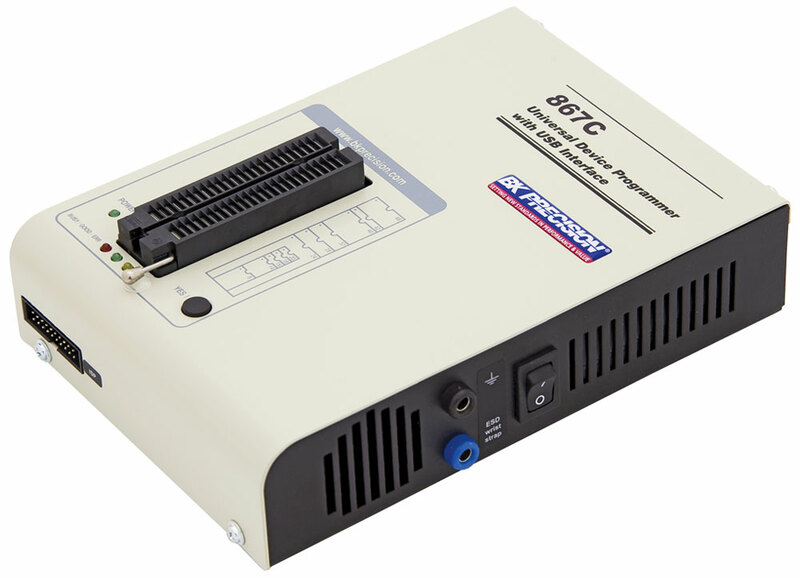 The 867C is a universal device programmer with an extensive device library of over 85,000 devices. Unlike EPROM only Programmers, the 867C is capable of programming FPGAs, PLDs MCUs and a wide variety of memory devices. For enhanced reliability, the programmer performs a continuity test on each pin prior to programming operation and provides ESD protection of up to 15 kV for each pin. Whether you are working with PLCC, SOIC, TSOP, DIP, TQFP, SSOP, PSOP or QFP, B&K Precision has an extensive line of socket adapters to interface with any IC package. The easy-to-use control program features pull-down menus, hot keys and on-line help, making it suitable for different types of users, ranging from hobbyists to professional R&D engineers. Devices are selected by class, manufacturer or by simply entering a fragment of vendor name and/or part number.